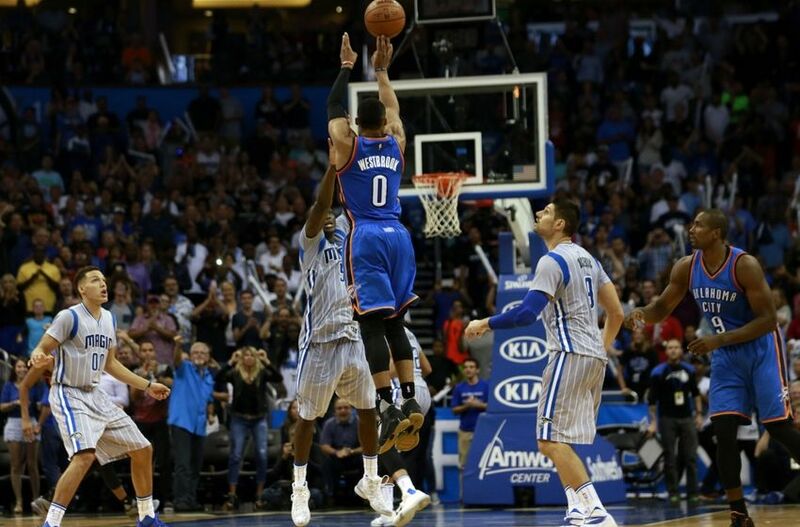 In case you missed this game on a busy sports night in October, with the World Series going on and prime time NBA games being broadcast on ESPN, the Orlando Magic and Oklahoma City Thunder kicked off the new season with a double overtime thriller. The word thrilling does not even do this game justice, as both teams hit a pair of big shots in what may have already been the best game of the season. Kevin Durant got the action started with this three out of at timeout to tie the game at 114 near the end of the fourth quarter. Big shot from Durant, but we should also give credit to first year head coach Billy Donovan, who drew up that play. I am not saying it was the best play, but it definitely got the job done. And it used Russell Westbrook as a decoy which is smart in its own right, considering what was about to come next. With the game tied at 114, the Magic had a chance to take the last shot and either win the game or go to overtime. Of course it’s easy to say looking back that the Magic should have taken the absolute last shot as time expired, but any time you can get this good of a look from one of your best players you have to take it. A great step back and shot by Victor Oladipo and the Magic begin to celebrate, thinking they had won the game. New Orlando Head Coach Scott Skiles criticized his team after the game for celebrating too early near the end of regulation because this happened. I love the captions to the vines on Zach Harper’s twitter account, who is a great follow for any basketball fan. Westbrook gets over half court and pulls up from 40 feet all with less than three seconds left and sends the game into overtime. The Thunder got up by five with 1:38 left before the Magic made a comeback of their own. You already know a second overtime took place, so here is how they got there. As Harper says, Home Dipo! Love that nickname, as Oladipo this time takes the last shot of the period and sends the game to a second overtime. It took another 10 minutes, but Oklahoma City finally separated themselves just enough to escape Orlando with a win. The young Magic team hung with the Thunder as long as they could, finally showing their youth in their final possession of double overtime. Orlando found themselves with the basketball down by three with only six seconds left, but were never able to get a shot near the rim. Kevin Durant blocked Evan Fournier’s first 3-point attempt out of bounds in the corner, and then blocked Olapido’s game-tying attempt essentially ending the game. Besides the phenomenal finish, this game taught us a lot about both teams very early on in the season. For the Thunder, we learned this team is going to be a serious contender as long as their stars stay healthy. Durant and Westbrook combined to score 91 of Oklahoma City’s 139 points. Dion Waiters still had his moments of needing to take shots at the end of games, when the ball should clearly be in Durant or Westbrook’s hands, but he has been playing better to start the season. I wonder if that has something to do with this being a contract year for him? As for the Magic they showed they are talented enough to be in basketball games with some of the best teams in the league. I was very impressed with how this team executed down the stretch with Skiles as their head coach. We all knew he would help this team improve, and its already starting to translate onto the basketball court. We all know what the Thunder will more than likely be if Durant and Westbrook can stay healthy – a perennial championship contender with possibly two MVP candidates on their team. Westbrook has been playing like a man possessed, at such a high level that I do not know if it’s physically possible for him to keep that up for an entire 82-game season. If anyone can do it, it’s Westbrook. The Magic have a lot to prove this season. It’s a big year for their young core, who are out of excuses as to why they shouldn’t look like a team on the rise. Orlando brought back Tobias Harris and are now looking to start competing for playoff spots in an Eastern Conference that has improved from last year. Injuries are the x-factor every team has to deal with throughout the season, but the Thunder really got hit hard as a team last season. Oklahoma City desperately needs to avoid another injury-riddled season in order to make a deep playoff run, as the franchise looks ahead and hopes this is not their last chance at a title with this core of players. This entry was posted in 15-16 Regular Season, Home, NBA and tagged 15-16 Regular Season, 40-foot shot, Billy Donovan, buzzer beater, double overtime, free agency, Kevin Durant, NBA, Oklahoma City Thunder, Orlando Magic, Russell Westbrook, Scott Skiles, Victor Oladipo, Zach Harper. Bookmark the permalink.